Norwegian explorer, anthropologist and author. Below is found information regarding the research and writings of Thor Heyerdahl including a bibliography of scientific and popular works. Arnold Jacoby, 1968, Senor Kon-Tiki. Allen and Unwin, London. Christopher Ralling, 1990, Kon-Tiki Man. BBC Books, London. Snorre Evensberget, 1994, Thor Heyerdahl: The Explorer. J.M. Stenersens, Oslo. BBC-TV Television Series: The Kon-Tiki Man. Africa 1977-78. Organized and led the Kon-Tiki Museum Archaeological Expeditions to the Maldive Islands. excavations at Tucume, Peru, 1988-94, discovering rich evidence of a pre-Inca maritime culture. (Foundation for Exploration and Research on Cultural Origins). publications on aboriginal migration routes into the East Pacific from Southeast Asia and South America. Nature 1977; International Patron, United World Colleges 1980-; Vice-Pres., Worldview International; Hon. Director, Explorers Club N.Y.;  International Advisor, Green Cross International 1993. 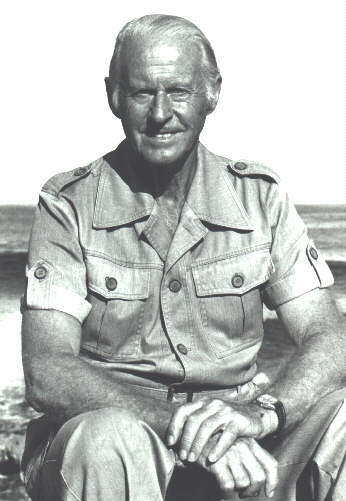 BIBLIOGRAPHY OF SCIENTIFIC AND POPULAR WORKS BY THOR HEYERDAHL. 1941  "Turning back time in the South Seas." National Geographic Magazine 79(1):109-136. 1950  "The Voyage of the Raft Kon-Tiki: An Argument for American-Polynesian Diffusion." 1951-1952  "Some Problems of Aboriginal Migration in the Pacific." 1952   American Indians in the Pacific: The Theory behind the Kon-Tiki Expedition. 1953  "Aboriginal Navigation in Peru." 1953  "Objects and Results of the Kon-Tiki Expedition." 1953  "Some Basic Problems in Polynesian Anthropology." 1955  "The Balsa Raft in Aboriginal Navigation off Peru and Ecuador." 1955  "Preliminary Report on the Discovery of Archaeology in the Galapagos Islands." 1957  "Guara Navigation: Indigenous Sailing off the Andean Coast." 1958   Aku-Aku: The Secret of Easter Island. Allen and Unwin, London . 1959  "Guara Sailing Technique Indigenous to South America." 1963  "Feasible Ocean Routes to and from the Americas in Pre-Columbian Times." 1964  "Feasible Ocean Routes to and from the Americas in Pre-Columbian Times." 1965  "The Concept of Rongo-Rongo among the Historic Population of Easter Island." 1965  "Notes on the Pre-European Coconut Groves on Cocos Island." Monograph of the School of American Research and the Kon-Tiki Museum, no. 24, part 2, n.p. 1966  "Discussions of Transoceanic Contact: Isolationism, Diffusionism, or a Middle Course?" 1966  "The Inca Inspiration behind the Spanish Discoveries of Polynesia and Melanesia." 1968   Sea Routes to Polynesia. Rand McNally, Chicago. 1970   The Ra Expeditions. (Doubleday, New York, 1971). 1974   Fatu Hiva. Doubleday, New York. 1978   Early Man and the Ocean: The Beginnings of Navigation and Seaborne Civilizations. 1979  "The heterogeneity of small sculptures on Easter Island before 1886. 1981   The Tigris Expedition. Doubleday, New York. 1986   The Maldive Mystery. Allen and Unwin, London. Instituto de Estudios Historico-Maritimos de Peru, Lima. 1996   Green was the Earth on the seventh day. Random House, New York. 1996   Hablan los vencidos. [Let the conquered speak.] Angulo Basombrio, Lima. extra-island parallels to Easter Island. 1998   I Adams fotspor. J.M. Stenersens, Oslo. English version (2000): In the footsteps of Adam. Little, Brown and Co., London. 1956  Archaeological Evidence of Pre-Spanish Visits to the Galapagos Islands. Memoirs 12, Society for American Archaeology, Salt Lake City. 1996   Tucume. Banco de Credito, Lima. 2000  Ingen Grenser. (No Boundaries) J.M. Stenersens, Oslo. 2001  Jakten på Odin. (The Hunt for Odin.) J.M. Stenersens, Oslo. Philadelphia,1952; Honorary Member, Geographical Societies of Norway, 1953, Peru, 1953, Brazil 1954. 1993; President's Medal, Pacific Lutheran University, 1996.